FREE! FREE! FREE! | Dragons Rule OK.
From now until 20th January, The Never-Dying Man, book 2 in The Wolves of Vimar Series, is FREE. Get your copy before it’s too late. Click here to go to Amazon where you are. In this book, the friends who call themselves Wolf go to rescue a friend’s kidnapped child and find themselves captauredby the Erian Army and taken to the capital city, Frelli. Here they meet The Master of Erian and discover some disturbing truths. They have to escape in order to deliver their information to the government in Grosmer, but this is not as easy as it sounds, and Carthinal has to face some unpleasant truths about himself. 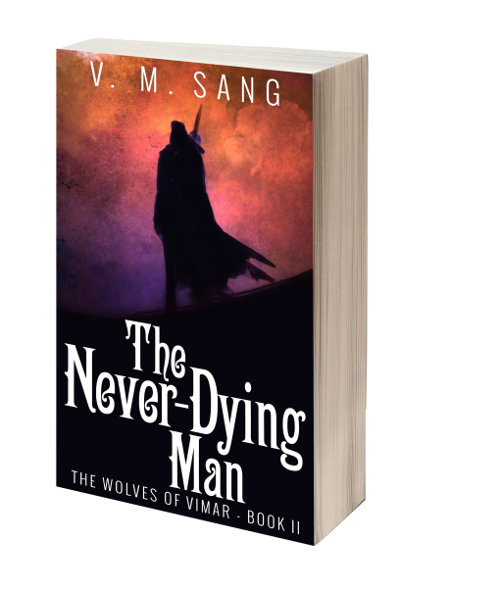 This entry was posted in announcement, fantasy, fiction, novel, offers, writing and tagged books, free book, free ebook, Free Fantasy Books, freebie, novel, writing by V.M.Sang. Bookmark the permalink.